According to the National Highway Traffic Safety Administration (NHTSA), the number of people injured while driving on the nation’s roads was 2.3 million people for the year 2013. Of these crashes, 330,000 involved large trucks (a truck with a gross vehicle weight greater than 10,000 pounds), and 24,000 resulted in one or more injuries. 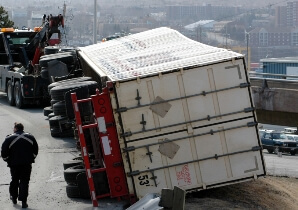 Large trucking accidents also killed 691 people in 2013.
Who Dies in Trucking Accidents? Unfortunately, our Houston trucking accident attorneys know that when a passenger vehicle collides with a truck weighing 10,000 pounds or more, the occupant or occupants of the smaller car are the ones who are usually killed. The statistics for fatalities in trucking accidents for 2013 showed that 73% of trucking accident fatalities occurred in the other vehicle, 18% occurred inside the truck, and 10% in non-occupants, such as pedestrians or cyclists. Alcohol – The number of those killed in trucking accidents where the driver was impaired by alcohol rose 14% from 2012 to 2013. Multiple vehicles – Fatal trucking accidents usually involved several cars, with 81% of multiple-vehicle crashes involving large trucks resulting in at least one fatality, compared to only 58% for passenger vehicles. Head-on collisions – The most common trucking accidentsc (46%) involves the truck and other vehicle colliding straight on, suggesting impairment of the truck driver. History – Truck drivers with previous recorded crashes accounted for 12.9% of trucking accidents in 2012, the highest rate among passenger cars, motorcyclists, and light trucks. In 2012, large trucks made up only 4% of vehicles driven on the road, but accounted for about 13% of all vehicular fatalities. In 2012, approximately 30,000 people died as the result of a vehicular accident and of these 3,921 died in a trucking accident. Although the minimum weight is 10,000 pounds to be considered a “large truck,” they are often over 70 feet long and can legally weigh up to 81,400 pounds in the state of Texas (each state has its own limitations). In 2012, the occupant or occupants of the other vehicle sustained 73% of all injuries resulting from trucking accidents. For the same year, 24% of injuries occurred in the occupant of the truck, and non-occupants sustained 3% of injuries. Given the disproportionate size of the trucks compared to the vehicles they strike, the drivers and occupants struck by a truck have a higher rate of injury and fatality than in any other type of vehicular collision. The nature of the injuries sustained in the passenger car often includes head, neck, and spine trauma. This is in addition to broken bones, concussions, lacerations, and other serious injuries, while injuries to the truck driver are often minor or non-existent. If you or a loved one has been involved in a trucking accident, please contact us to discuss your case with one of our Houston trucking accident attorneys at no charge.